10 days of fun in Costa Rica when a friend visits! April 27th was a busy, busy day – picked up a friend from the U.S., Pat at 5 a.m.; finding nothing open for breakfast, we ended up coming home. We really aren’t far from the airport, which is a good thing, because Mark was arriving home at 11:00 that same morning! We certainly had three happy dogs; they were happy Mark was back home, and they remembered Pat!!! Didn’t do much since Pat had an overnight flight and was exhausted. But Friday morning we were up and at them! Took her to the Feria first and she was flabbergasted at the size of some the veggies and fruits here. Then we headed for massages…..and we were to tally wasted for the day! Made a trip to Grecia and Sarchi…..I’m still in awe at watching the painters work on the souvenirs, etc. Hooked up with Lee and went to Salitral to a great pottery place. 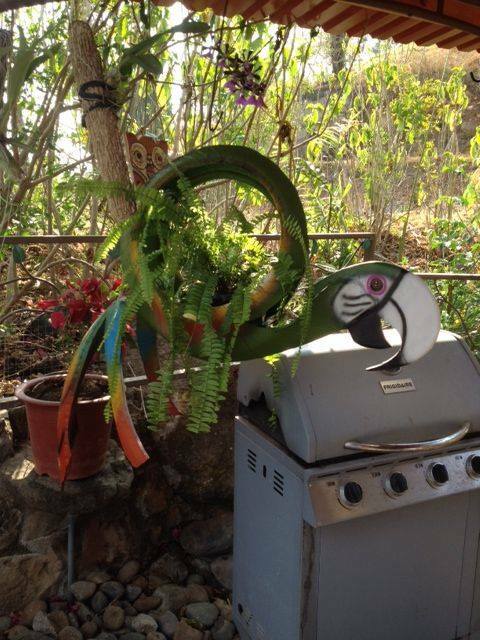 Oh, and Pat bought a Parrot made out of a tire – altho’, she really wanted a toucan! When Mark took it out of the car, his immediate comment was “you’ll never get this in a suitcase!” I was just positive it was the same size as my Toucan, however, it’s much bigger. Yep, it’s much much bigger and made out of a regular sized tire, I guess. So, she left it here for me to sell, if anyone is interested in it…..
Then Tuesday morning, Pat, Michele (from from Costa Rica) and I went on a 3 day, 2 night adventure – and what an adventure it was! We had reservations at Hotel Verde Mar Del Pacific, which is basically on the beach!!! There is an old airplane on the way to Manuel Antonio that has been turned into a really neat restaurant. And since it was lunch time, the car just stopped there! There are tables and chairs in the actual airplane along with a couple of levels added on to the back of the airplane with lots of tables that have views of the Pacific. I recommend it….. The first full day we were there we spent on the beach on lounges under an umbrella. Water was warm, like bath water. I loved it because I like all the beach vendors coming up to sell stuff!!! After awhile we took a walk and found a bunch of shops, which I’m sure is where the vendors get their things to sell, even though they all tell you that they made it! We all bought a few things and headed back to the beach. My favorite beach vendor of all was the massage lady! For $30 I got a massage on the beach…..listening to the waves come in, it just doesn’t get much better than that!!! And it was supposedly an $85 massage if you went to her studio! So look at the money I saved. Then we headed back to the room to get ready to head out to eat….and I can’t remember the name of the place, but it was really good. Did I mention it was happy hour also? After stuffing ourselves, we headed back to the room. And then someone noticed it was about 7 p.m. and we were in jammies and in bed reading. Cracked ourselves up till I got a notice on facebook/internet that a huge 8.0 earthquake hit Chile; and where we were in Costa Rica, we were in a tsunami watch area. Mark had told me to not call unless there was an emergency so I messaged him instead of calling. He hadn’t heard about the earthquake/tsunami stuff. So he went on the internet and kept us informed; he wanted us to leave – remember we are staying right on the beach. At one point he said, “it’s not that far, drive home and go back in the morning”, which wasn’t happening since I was the driver. Another friend from the US suggested we take turns sleeping….ah, not a good idea with a possible tsunami on the horizon! Pat and I headed to the front desk; the desk clerk might have been 14-15 yrs. old! When I inquired about it, he had no clue what I was talking about; then he wanted to know how I knew it; duh! How does anyone know anything now, the internet! So as he was trying to assure me that the large rocks in the water, would slow the tsunami down; and that if we needed to evacuate, the police would come with sirens. Now I’m looking at the narrow road there and realizing that I would never get out in the traffic…..
so we decided to search out someplace that was higher…..yep, back to the airplane restaurant! Only this time, two of the three of us had already taken sleeping pills, we were all still full from dinner; so we ordered dessert! After sitting there an hour or so, we received an email saying the tsunami watch had been cancelled. So we finished our “food” and jumped back in the car and went down the hill to our little hotel. The next morning we got up, loaded the car and headed to Playa Dona Ana to feed the monkeys at the beach. So fun!!! Then on to Jaco and breakfast; can’t remember the name of the restaurant we had breakfast at, but next time in that area, I will be going there again. Wonderful, wonderful food! Shopped a little there but as you know, Jaco, is hot, hot, hot! Back to the car and then on with our journey home. Arrived home around mid-afternoon and I don’t know why, but we were exhausted! Guess it’s the heat! It was fun to get away for a couple of days – and going with girls and shopping, well, let’s just say, we all had a great time! 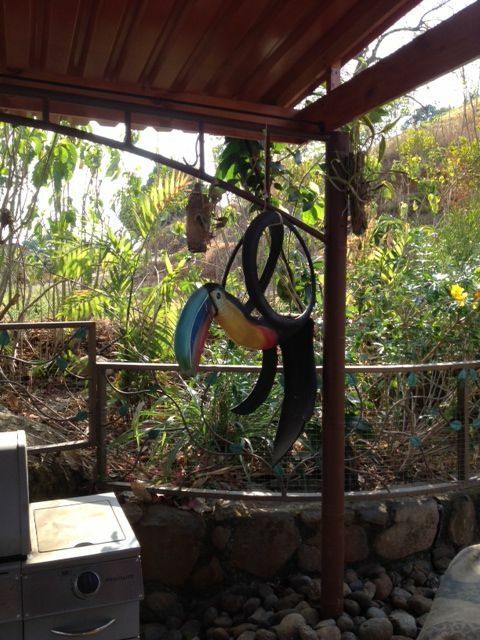 Pat enjoyed her time in Costa Rica and says she’ll be back!! !